These pens were made from Osage Orange (Maclura pomifera) wood that was harvested by my brother from the Yreka area in Northern California. The wood is difficult to work with, splintery and splits easily but is a rich golden color when finished. Osage Orange wood darkens with exposure to light and elements in the environment as shown in the bottom photo. I made the pen at the top for my wife more than five years ago and its original orange color was similar to the newer pens. It now boasts of an exotic golden brown. Mechanism: Cross style, and refills are available in most office supply stores. 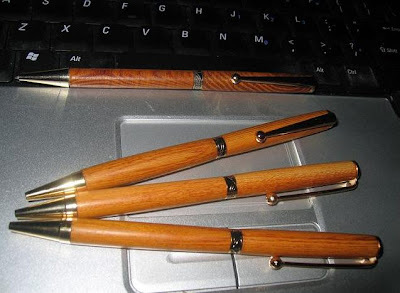 Finish: The pens were sanded up to 400 grit, then burnished with 0000 steel wool to bring up a smooth surface. They were then finished with mineral oil, bee’s & carnauba wax and a final polish with paraffin wax.